I wanted to share a bit of my Grandfather’s war history with you. He didn’t share a lot of stories with us girls but I remember a few. I called my Uncle Terry and between the two of us, we decided on a war story that many of your relatives that fought in WWII could possible identify with. 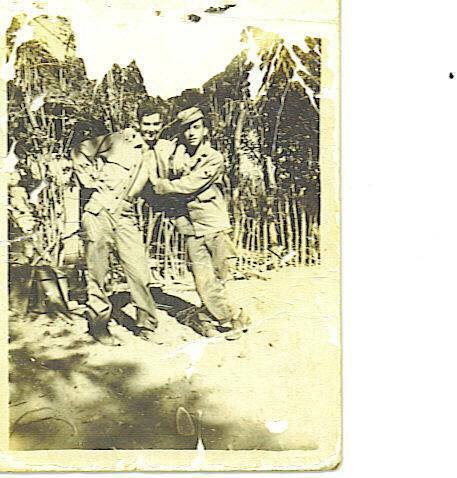 My Grandfather Merle Nipper (pictured above, the tall dark-headed man) was the age of 21 when he was called to war between the years of 1944-1946. He wasn’t a child, yet he hadn’t even begun living his life. He was use to hard work and was raised on a farm but he also liked having a good time as most young men his age. You can see from these pictures he was a cut up and like to have a good time. He and my grandmother wouldn’t get married until after the war was long over and they would go on to have seven children. He left Jefferson Barracks, MO and headed to Texas. When he was through with training he was a 148th Inf Regt 37th Div member, and from there he would see the world in an action packed three years. He lived a long life and never set foot on an airplane, however he would make it the Philippines and back safety. He always traveled by ship and even told a story about seeing the Golden Gate Bridge by traveling underneath it by boat. One story that we thought we would like to share was that of his time behind enemy lines for weeks in the Philippines on a ridge top. The bottom of the large hill was surrounded by Japanese military. He thought close to 350 fellow soldiers were locked on the hill with him. Soon they would have food dropped to them by parachutes but the wind would move those parachutes as they dropped to the ground to the Japanese’s forces. My Grandfather said they spied the Japanese opening the crates and eating the food. There was little to eat and the fighting was relentless from hour to hour for the Americans. Eventually, walkies-talkies and other supplies were delivered to the Americans holding the ridge top. They were not about to give up the hold they had secured but they couldn’t continue letting the Japanese get closer to them. The pilots were going to bombard the hill with smoke bombs and artillery. The American soldiers were going to have to make a run for it past enemy fire while they in turn returned fire through the smoke! 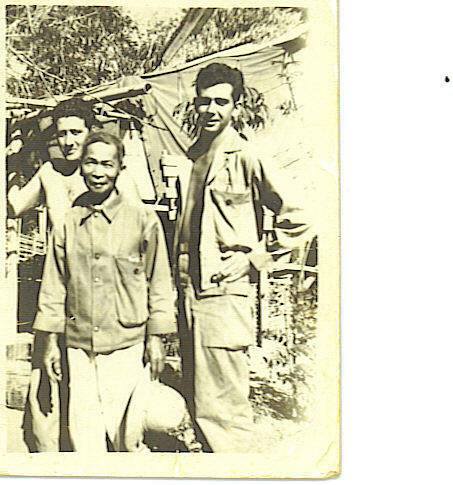 My grandfather and the others ran so hard down the mountain he was exhausted by the time he reached safety. He climbed up on the roof of the cargo truck that was driving them to camp, and he fell asleep. He was exhausted and rightly so. My grandfather remembered there were close to 50 soldiers that made it off the hill that day alive. I cannot find information to support that exact number that died that day but he was very-rarely-ever wrong. When he finally arrived at camp and settled in to his tent, he fell asleep- hard. The battle on that hill was won by the Americans. There are many more stories that involved tunnels, swampy areas, weekend breaks, camp being attacked, driving a large gasoline fuel truck and the one directly in front of him exploded, and something about a bank. Without my grandfather actually here, it is hard to recreate his accounts from our memories of his stories. Philippine Liberation Ribbon with One Bronze Star, Asiatic-Pacific Theater Ribbon with One Bronze Star, World War II Victory Medal, Good Conduct Medal, and Two Overseas Bars. After doing research of the battles of Luzon for the years of deployment in the Philippines I have so much more respect for what he endured. What all those men endured. I cannot imagine living with the horror that he saw. If you would like a better idea of what these boys endured on the American side and the what the Japanese endured you can read about it here. Another website I found you can check out here. The actual years that my Grandfather served over there was 44’-46’. My grandfather is gone now and we all miss him. I wanted to write this post as a tribute to him and so many others that have served or are serving, or lost their life protecting others.